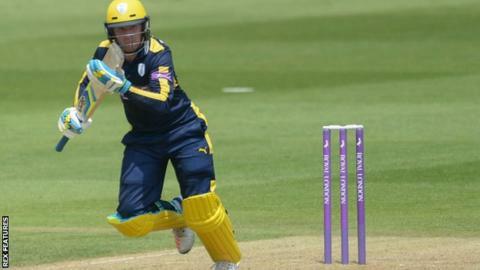 Liam Dawson made an unbeaten 68 as Hampshire beat Middlesex by five wickets in a rain-hit One-Day Cup game. Brendon McCullum gave Middlesex a flying start at Radlett with a 35-ball half-century before he fell for 74. Eoin Morgan weighed in with 52 off 47 balls as they posted 295-8, with spinner Mason Crane taking 4-80. Hampshire were set a revised target of 202 from 26 overs, and Dawson and Sean Ervine (45) added 89 as they reached 204-5 with three balls to spare. The victory, which followed defeat by Essex in their opening game, lifted the visitors up two places to fifth in the South Group. A storm halted play early in Hampshire's reply, but Adam Wheater (41) and Jimmy Adams shared a stand of 62 in eight overs either side of the hold-up. And although they still needed 88 from the final 10 overs, Dawson and Ervine kept the scoreboard ticking over before the latter was bowled by James Fuller. Dawson, who took 1-32 and three catches in Middlesex's innings, followed his 70 not out against Essex by reaching 50 off only 30 balls before Gareth Andrew struck the first ball he faced for the winning boundary.